What and when should I receive benefits? These are great questions, and ones we will answer for you at no cost or risk. Iowa's workers' compensation program is complex and can be difficult to understand. If you know someone else who has gone through their own workers' compensation claim, you may be familiar with their frustration. What you may not know is that some attorneys, including all of us here at Walker, Billingsley & Bair, will talk with you for free about your claim. It is helpful to talk with someone who has handled hundreds of workers' compensation and "third-party liability claims." Do you know how much you should be paid for mileage to and from medical appointments and the pharmacy? Do you know the difference between temporary total disability benefits (TTD) and permanent partial disability benefits (PPD)? Do you know how to calculate your rate based upon your average weekly wage (AWW)? Do you know how your impairment rating is calculated and if the rating you were given is correct? Do you know the difference between a scheduled member injury and an unscheduled injury also known as an industrial disability injury? Do you know if the Iowa Second Injury Fund applies to your scheduled member injury case? Do you know how workers' compensation payments affect Social Security disability benefits? These are questions that can be answered by our experienced workers' compensation attorneys. As an injured worker you have the right to seek legal advice regarding your workers' compensation and/or third party liability claim. otherwise doing your job duties. 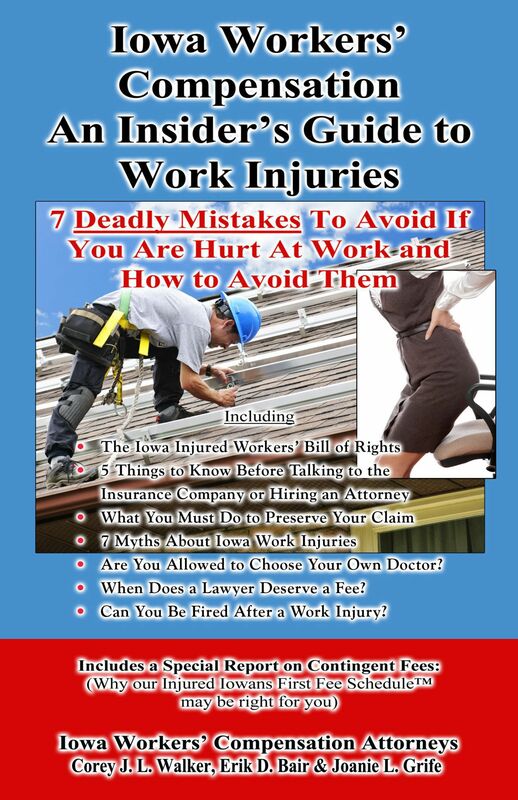 Before you sign any documents from the insurance company or make a mistake that could hurt your workers' comp case, you should educate yourself by requesting our work injury book at no cost! To claim benefits for workers' compensation, you must prove that your injuries arose out of and in the course of your employment. The insurance adjustor works for your employer and/or their insurance company and has no duty to protect your rights or even tell you what the law is. Lifelong medical care related to the work injury. Cash payments while you recover and cannot work because of your work injury. Iowans and injured workers with Iowa claims are beginning to realize that if they have been hurt at work that they should learn how to avoid making mistakes and what they should receive for their work injuries. If you or someone you love has been injured, then you should request our Workers' Compensation Injury Book at no cost, risk or obligation. Just click on the book now or call 800-707-2552, ext. 811 (24 Hour Recorded Message). Our Guarantee- We are so confident that our book will help educate you that if you have been hurt at work and do not learn at least one thing, let us know and we will donate $1,000 to your charity of choice. Our law firm handles workers' compensation cases and personal injury claims throughout the state of Iowa. We have four fully staffed offices located in Des Moines, Ankeny, Newton and Marshalltown along with by appointment locations throughout the state. If you are not local to us then we will come to you. After years of helping injured workers seek justice for their work injuries, we know how beneficial having legal counsel can be, but we also want you to get the facts about finding the right work injury attorney for your case which is explained in part below, but in more detail in our book. Does the attorney practice Iowa workers' compensation law? Look to see where their physical offices are located and make sure that are an Iowa based law firm, not just attorneys using office share space in Iowa. Is the attorney experienced in workers' compensation law? Look at what their former clients have to say. Will the attorney pay attention to my case? Did they attorney return calls? Look at an attorney review site to find honest reviews. Lastly, what results has the attorney had in Iowa work comp cases? Results matter and an attorney should be able to provide you with past results. No one is happy they were injured at work and most people hope they never have to hire an attorney. We hope that you recover from your work injury and get back to work and life as usual. We provide this information so that you are informed and can make the best decisions regarding how to handle your case. Your call is free and there is no obligation to hire us. One of our work injury attorneys will answer your questions and start you in the right direction with your workers' compensation case. If you prefer, fill out our online contact form and get the information you need about cases of workers' compensation in Iowa.